Because we have yet to top our own human ingenuity and create something more efficient than the internal combustion engine (thank you, Jean Joseph Étienne Lenoir), we are for the time being stuck with a transportation method that relies on gear shifting to control correct speed and power application. That means that, when keeping your vehicle maintained, your transmission is going to be high on the list of priorities. Theoretically, anyway. Chances are that it will be if you’re driving a manual system, which requires a bit more thought and effort on your part to use. If you’re cruising automatic, however, you likely won’t be giving your shifter much thought until it goes south and leaves you stranded. On your way to that important business meeting, too. Bummer. The easiest bit of maintenance for a transmission is replacing its fluid, which is something you want to do regularly, like with so many other liquids you’re frequently required to dump into your engine. That, however, is only going to get you by for so long. Eventually, a car that you’ve clocked a significant number of miles on is going to break a little more drastically, and if your transmission is to blame, you’ll have on your hands a problem that requires something beyond a few fluid ounces to fix. If you’re lucky, you’ll be able to repair the damage and keep the cost minimal — say, have a hole plugged for a couple hundred dollars. If you aren’t so lucky (and, unless you’ve won the Powerball recently, when is that not the case? ), you might need to rebuild or outright replace the system, as minor leaks and component failures can damage the whole transmission if not caught early. That’s when the dollar signs turn ugly: rebuilding can cost between $2,000 and $3,000, and replacing can turn into a $4,000 to $8,000 job depending on your model. Obviously, we want to avoid the second solution if we can, but the first can be tricky to get done properly. 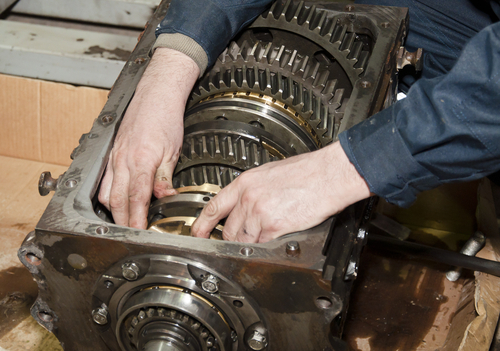 Because the transmission is a component that many drivers don’t know well, you could be overcharged for a superficial-at-best repair if you aren’t discrete in your choice of shop. Many don’t have the equipment or experience necessary to properly clean and manage all of the pieces that need to be switched out and/or reinforced to prevent additional damage (and perhaps a guaranteed need for a full replacement) a few thousand miles later. Here’s where our shameless plug comes in: we at Earl’s Transmission Service live and breathe this type of repair, because we want to guarantee a fix that balances thoroughness (so that you don’t yell at us for a shoddy job) with cost efficiency (so that you don’t yell at us for a shoddy bill). We want what you want: to get your car back on the road, of course, but with a sense of safety and a not-too-light wallet along with it. That isn’t too much to ask for, we think, and we’ll help you get it.